Oh hey, it's that thing I saw on the internet! Greek yogurts are still super popular, and I'm slowly but surely being converted to the Greek side with their yummy cinnamon bun, rhubarb, watermelon, and banana flavorings, so I just had to give this a try. I mean it's a yogurt flavored like a sandwich? As a food blogger I'd feel like a failure if I didn't check something like this out. Plus I pass Trader Joe's on my way home from work every single day. It's a sign. I had to have to yogurt. The packaging for this item is the same as every other yogurt out there. Plastic cup. Foil top. As boring as that is, it works well. As for the design, it's simple, a little playful, and the striped pattern mimics is sandwich-y counter part. It's not the best looking design in the world, it's obviously unpolished, but what did you expect from a PB&J flavored yogurt? High end design? I think this low key layout goes well with the product, and even though you won't be seeing this on fancy food packaging sites like The Dieline (one of my favorite places on the internet) it does it's job well. I'm so excited! Let's dig right in. I peeled back the lid and...oh. Oh my. This...this is really liquidy, and it's not at all what I expected. The yogurt is a light peanut-y color and it's no where near as thick as the Greek yogurts I'm used to. This is more of a creamy salad-dressing consistency than a Greek yogurt. Since the product was named "Peanut Butter & Jelly with Greek Yogurt," I had assumed that this would be like those yogurts with layered flavors. I was wrong. This is no fruit on the bottom and peanut butter on top yogurt parfait, this is peanut butter and jelly pureed into yogurt, which is not what I signed up for. My excitement has turned to dread. I brought the plastic cup close to my face, since whatever aroma this had was pretty weak, and it smells like a peanut butter and jelly sandwich on white bread. It's insane! I was so shocked by the smell I called my sister over to check this out, and after a quick whiff she recoiled in horror. She obviously wasn't a fan, but I can't get over how authentic this smells. It literally smells just like the white bread sandwiches I would make for myself after school. (I am a strawberry PB&J lover for the record, and that's what this yogurt is based on.) Maybe this won't be so bad after all. I scooped up a spoonful, which wasn't pretty, and popped it into my mouth. The first thing I noticed was it's texture. I want to call this texture gritty, but that really isn't it. The textured parts aren't rough or hard, like seeds, more like there's some kind of itty bitty peanut butter pockets floating around in this yogurty base. I think it's caused by the peanut butter not being fully incorporated into the yogurt. So it looks unpleasant, and it has a weird texture, but how does it taste? Honestly, pretty good. I wouldn't say it's great, but it's no where near as bad as it looks. 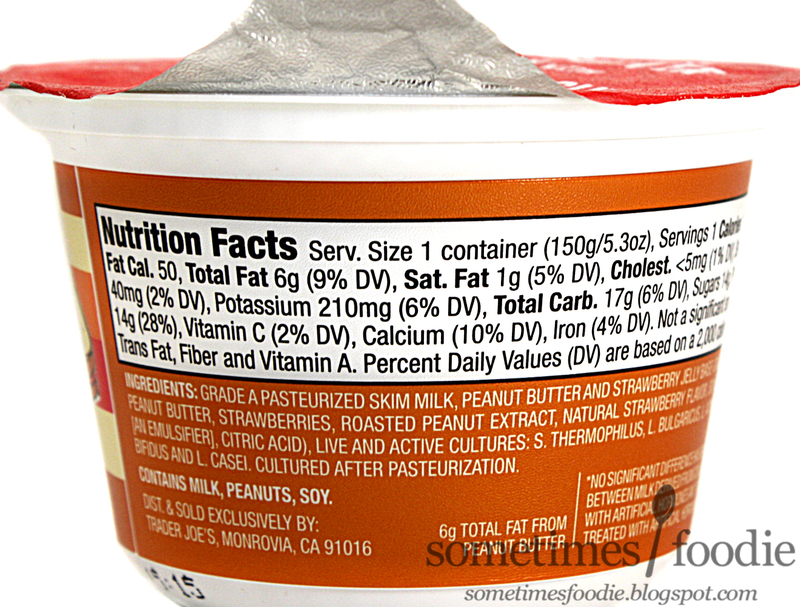 The peanut butter is the strongest flavoring, followed by a mellow and sweet strawberry Greek yogurt. This isn't a bold IN YOUR FACE kind of flavoring, it's more mellow, which makes it a lot more enjoyable. If you took a container of strawberry Greek yogurt and added some of that fancy peanut butter powder that all those healthy food bloggers talk about, I imagine it'd taste like this. (It'll most likely have a similar texture too.) 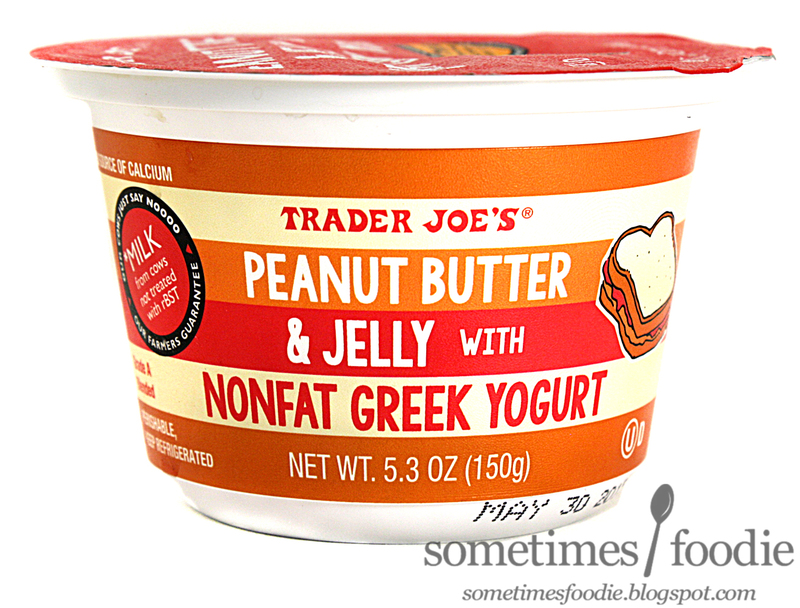 It's peanut butter-y, and there is a hint of sweet strawberry jelly in the yogurt. That's really it. 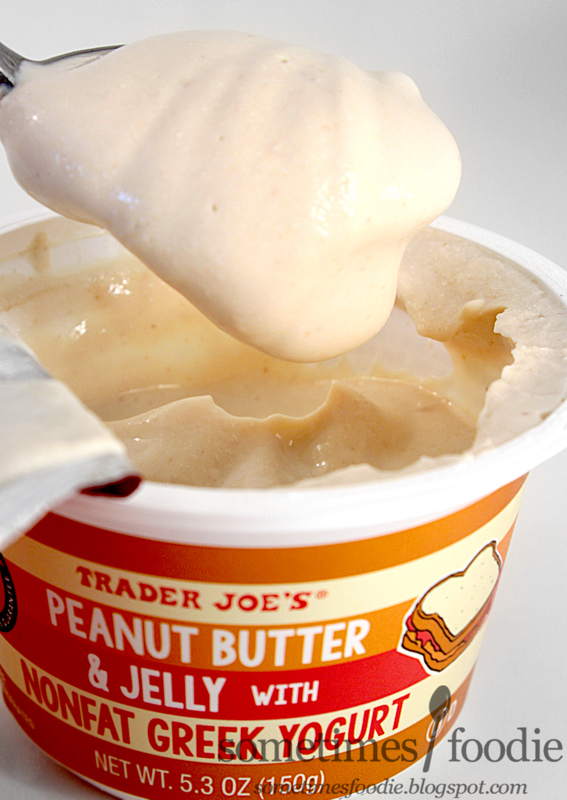 No chunks of fruit, no layer of jam or peanut butter, just a PB & J flavored yogurt. As I left Trader Joe's, the employee ringing me up mentioned that he tried it himself the day it came out, when I asked him what he thought, he said he liked the sandwich better. I'd have to agree. This isn't as intensely fruity as the sandwiches I make for myself (I prefer a high jelly to peanut butter ratio in my sammiches) but really, it's pretty nice. This product is a gimmick, but it actually works a lot better than you'd think. I bet Greek yogurt loving carb haters would love the idea of PB&J without the bread, and peanut butter fanatics might really get a kick out of this, but I personally would have liked to see a layer of jam at the bottom, or chunks of actual strawberry mixed in. If you like Greek yogurts, I'd think this is a must try for the novelty aspect alone, but really, it's not bad. I might even buy it again. I was really excited to try this as well! Wasn't a fan at all. I know exactly what you mean by "gritty;" I described it as "chalky." I think it needed to be sweeter or more on the jelly side. Really all that stood out to me was tangy yogurt and salty peanut flavor. I am not so sure the "Tangy & Salty" genre is going to catch on. Chalky is an excellent way to put it! Oh man, that hits the nail right on the head. I actually liked this quite a bit, but it definitely does need more jelly/jam kind of flavoring in there somehow to perfect the PB&J balance. I would have liked some kind of strawberry puree at the bottom, or bits of strawberry mixed throughout. OMG I was so sad that it wasn't layered. I feel like they really missed an opportunity. I love stirring nut butters into greek yogurt and part of why it's so good is the textural difference. This is literally boring beige goop. lol. Agreed, it is wacky, and I would have liked a little bit more strawberry-to-Peanut Butter ratio, but it tasted pretty good! Much better than a novelty PB&J yogurt should taste.